This custom overlay can be made to co-inside with your already custom foam filled case. This overlay is cut to match the area where your parts will be placed in the foam.Small type is printed on to help you indentify your parts or product. No more worrying about where you part goes. 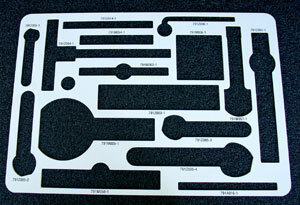 This easy to read label goes over your foam to help you distinguish placement. Easy peel off backing adhesive afixes the overlay to the foam to keep in place. Each overlay is custom fit to match your custom case specifications. We are proud of the design solutions we’ve provided our customers over the years. We are confident that we can provide the same service to you. Please contact the Engineering Department for a quote on a custom foam overlay at 800-222-1555, fill out our Custom Request For Quote Form or e-mail: info@plattcases.com.